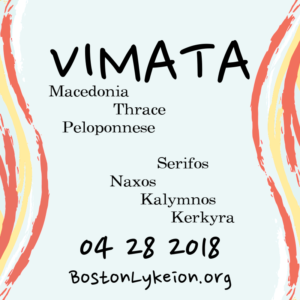 We are thrilled to announce the repertoire for Vimata: A Greek Dance Workshop, taking place at the Greek-American Political Club in Cambridge, MA, on April 28th, 2018! The repertoire of popular regional dances of mainland Greece will include “Gaida” of Macedonia, “Lotzia” of Kozani, and “Tsestos” of Eastern Roumilia, Thrace. An additional highlight will be a variety of less often seen dances from the Peloponnese, including Argolida, Messinia and Corinth. Finally, dances from the islands of Serifos, Naxos, Kalymnos and Kerkyra will round out this exciting workshop! To learn more, visit the event page.